A tracheostomy is an opening created at the front of the neck so a tube can be inserted into the windpipe (trachea) to help you breathe. If necessary, the tube can be connected to an oxygen supply and a breathing machine called a ventilator. The tube can also be used to remove any fluid that's built up in the throat and windpipe. 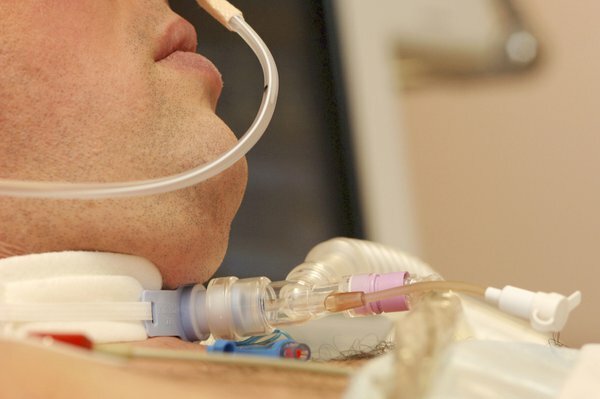 In many cases, a tracheostomy will be planned in advance and carried out in hospital, although sometimes it may need to be done in an emergency outside of hospital, such as at the scene of an accident. Read more about why a tracheostomy may be needed. A planned tracheostomy is usually carried out under general anaesthetic, which means you'll be unconscious during the procedure and won't feel any pain. A doctor or surgeon will make a hole in your throat using a needle or scalpel before inserting a tube into the opening. A dressing will be placed around the opening in your neck and tape or stitches will be used to hold the tube in place. If you're unable to breathe unaided, the tracheostomy tube can be attached to a machine that supplies oxygen to assist with breathing (ventilator) to increase the flow of oxygen to your lungs. Specialist equipment can also be used to warm and moisten (humidify) the air breathed in. In an emergency, the tracheostomy will be carried out as soon as possible using a local anaesthetic if there isn't enough time to use a general anaesthetic. This means you'll be conscious during the procedure, but shouldn't feel severe pain. After having a tracheostomy, you'll need to stay in hospital for at least a few days or weeks. In some cases, it may be possible to remove the tube and close the opening before you leave hospital. However, the tube may need to stay in permanently if you have a long-term condition that affects your breathing. It's possible to enjoy a good quality of life with a permanent tracheostomy tube, but it can take some time to adapt. Most people will initially have difficulty talking, eating, exercising, and keeping the tracheostomy tube clean and free of blockages. If you need a tracheostomy, a specially trained therapist can give you advice and answer any questions you have. They'll make sure you feel confident about looking after the tracheostomy before you leave hospital. Read more about living with a tracheostomy. A tracheostomy is generally a safe procedure that works well. But, as with all medical procedures, there's a small risk of complications, including bleeding, infection, and breathing difficulties. Read more about the possible complications of a tracheostomy.